Have you heard of typesetting? It is the process of selecting typefaces and arranging words and letters on a page. 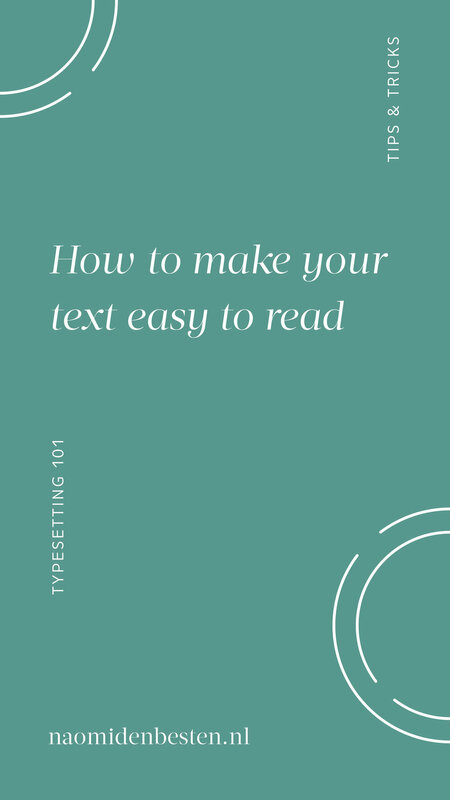 If you know how to set type the right way, you are increasing the chances that your audience will actually read what you have written. Now who doesn't want that right? Great typesetting makes your text more legible and you will create a seamless reading experience. Below I've shared a few tips & tricks that you can use in most text editing programs as well as on your website. A lot can be said about typeface selection. To keep it simple I would recommend using a basic sans-serif or serif font for your body copy. Choose one that is easy to read. For your headings and quotations, you can choose one or two typefaces that have a bit more character. If you're looking for interesting type combinations you can check out Typewolf. Your eyes shift from left to right across the page and each time a line ends, they have to find the beginning of the next one. If your lines are too long, the eye gets lost on its way back. If the lines are too short, your eyes have to move very fast. Note that line length is related to the size of your text; if you use a larger point size, you will have shorter lines. If you create a few heading styles, you can use them to help the reader scan the text. You don't have to make a heading larger, bold and in a different colour; one of them is usually enough. Stick to your brand fonts and the weights, styles & colours you (or your designer) have selected. There needs to be enough separation between lines of text so that your eye can distinguish them more easily. Most programs have the leading (also called line spacing & paragraph spacing) set to 1.15 or 1.2 times the point size. You can increase this up to 1.5, just make sure that the gaps between the lines do not become distracting. Shorter lines require less leading, longer lines require more. Left aligned text creates a so-called 'rag' on the left side of your paragraph. It is always good to check that this rag does not draw too much attention to itself. Central alignment can be fun to play with and is best suited for very short paragraphs. This is because it has a rag on the right side of the paragraph and is, therefore, more difficult to read (your eye has to find the starting point). Justified text creates a clean rectangular text block. It is efficient as well; you’ll need less space on a page. It can, however, lead to ugly and distracting gaps between words, especially when a text column is narrow. You can make adjustments using hyphenation settings and tracking (changing the overall spacing between letters in lines of text), but that requires quite a bit of skill and experience, not to mention the right design programs. To be on the safe side, only justify text in text columns that have a line length of about 10-15 words. Try not to have a single word - or very short line - at the end of a paragraph; the white space will interrupt the reader’s eye. Also, make sure that the last line of a paragraph is not on its own on the next page or in the next column. You can fix this by increasing or decreasing the space between words, adjusting hyphenation or editing the copy for instance. Note that this is a lot more difficult, if not impossible, to control on your (responsive) website. This is especially relevant when the text is set in a smaller point size. Adding a bit of air between the capital letters makes it less of a solid shape and thus easier to read. Don't do this too much with lowercase letters; the counterform created between those letters is important for legibility. Also, only put short phrases in capitals, not long sentences. This one is simple but often overlooked. Use smart quotes for quote marks or apostrophes instead of so called dumb, straight marks. The smart versions will look either curly or sloped. Use the ⌥ Opt, ⇧ Shift and [ ] keys to type them out. This last one is mostly just for fun. Did you know that you can use additional characters in a font? Often there are different sets of numbers, characters and other glyphs to play with. I use CopyChar as well as the Glyphs palette in Adobe programs to have quick access to special characters. If you have any questions about typesetting, head on over to Instagram and let me know!